There is one thing you could count on as I grew up, and that was a big, beautiful garden. Where we lived at the Baker Ranger Station in Monticello, Utah, and in Salt Lake City where I moved when I was twelve, we always had a big garden with onions, tomatoes, corn on the cob, long delicious green beans and much, much more. I have always said that my parents were raised in the late pioneer era. My mother was raised in Coalville, Utah, as one of ten children, and my father was raised in Heber, Utah, as one of six children. The time was 1910 to 1925. In those days if you did not raise a garden of fruit and vegetables that could be bottled and put in the cool basements, you may not make it through the winter. One of my favorite things to do was to go to the garden in the spring and eat delicious green peas in a pod. On the other hand, one of my most dreaded things in the winter was to go to the dark basement to get a bottle of fruit or vegetables that my mother had canned. I was so afraid that someone might be in the dark and get me. Still, to this day, I do not like to go to the basement at night. I turn on every light I pass and lock the door as I come up the stairs. As long as my parents were alive, I could go to the family home and my parents would give me loads of beautiful vegetables that they had raised in their garden. Now that they have both passed away it has become my job at my home to figure out a garden that I can manage with my travel schedule. Instead of a big backyard garden that I have to weed, I have decided to fill in all the dirt areas of my yard with little patches of garden. 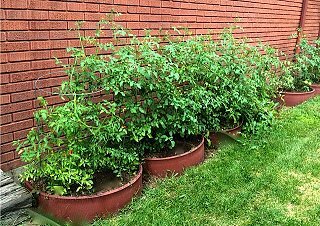 My tomatoes are planted in tires that are turned inside out and painted the color of my house trim. One of my students who came to take my public relations class taught me how to turn tires inside out so that I could plant small pieces of garden in the tires. I now plant my tomatoes in the tires, which are warmed through the day by the sun. This helps the plants to grow faster and produce more tomatoes. The inside-out tires that border this garden collect heat throughout the day, helping the tomato plants grow faster. I got my next idea for an herb garden from the Betsy Basely, who was the food editor of the Los Angeles Times for years. She showed me her herb garden one day when I was visiting her in L.A. I came straight home and with the help of the good people at Home Depot to saw the wood I made one that I could demonstrate on TV for Channel 4 in Salt Lake City. It is three different wood boxes, one set on top of the other so that you have twelve areas to plant herbs and they do not grow into each other. 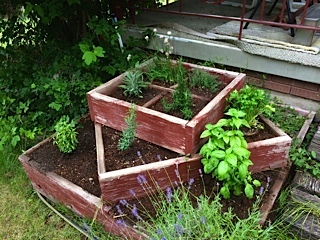 This is such a great way to make an herb garden. These three frames make a dozen distinct areas for growing herbs. You can see that I do not use all of them. The last idea came from a sweet lady that I met last year at the farmers' market. She was from Laos and spoke with a real broken accent. Her name is Chew. She had the most beautiful greens to sell. I asked her where she grew them, and she said in her backyard. I then asked her if I could go to her home and see her garden. She invited me to come to a lunch to meet her delightful family. Then she showed me her garden. 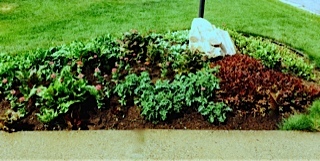 Even though her garden was tiny, every inch of it was planted into greens. She plants her small backyard in the spring, and throughout the summer she cuts the greens on Friday and sells them at Salt Lake City's downtown farmers' market on Saturday. She is truly an inspiration. She offered to go to my home and show me how to plant a small garden in my front yard in an area that I had been planting in flowers. It turned out so well I did it again this year and where I had holes in the vegetables I just bought 2 flats of red Zinnias and filled in the holes. If you could see this garden closely, you would discern that there are all sorts of edible plants here. The little spots of color are zinnias, which fill the holes. I have loved learning from dear friends that I have met along the path of life, who have been so willing to share with me so that I could plant a garden that I can grow in between the trips that I lead to South Africa, Peru, and China. What a blessing it is to go out and pick my garden vegetables and have a delicious and nutritious meal in minutes. the office at (801) 917-1131. Tell them that Dian sent you and they will give you a discount on your next trip. She will be leading a trip to Peru that leaves on Sept 20th, 2014 and one to China and Nepal that leaves on November 11th, 2014. For special sales on her books, go to http://www.dianthomas.com.